The spacious light and airy open plan ground floor kitchen/dining/family room is a very sociable space with French doors opening out onto a terrace, with outdoor furniture and a barbecue – perfect for outdoor dining. Further cosy large sitting room with comfortable sofas, a wood burning stove, TV and French doors opening out onto the terrace. An ideal base for families and groups of friends, with parking for four cars. Welcome to Harvest Moon, with plenty of room for eight plus pooch! This beautifully converted threshing barn is thought to be over 400 years old and is bright and airy with contemporary décor and a wonderfully cosy wood burner. The landscape here is truly amazing with numerous countryside walks from the doorstep and the Devon coast within easy reach. This luxury property is the perfect escape for a family, and welcomes two-well behaved dogs. Situated on a quiet, semi-working farm in the tiny hamlet of Curscombe, Harvest Moon boasts charming features and is elegantly furnished throughout with great attention to detail. The welcoming home-from-home is light and airy and benefits from a spacious open plan kitchen/dining/family room - a very sociable space with French doors opening out onto a terrace, with outdoor furniture and a barbecue. There's also a separate large sitting room with comfortable sofas and TV which is made cosy with crackle of a wood burning stove, perfect for chilly evenings. On sunnier occasions, guests can throw open the French doors to invite in a cooling breeze, enjoy an al fresco feast on the terrace or settle outside on the lawned gardens. Upstairs, the four spacious bedrooms are combined with two first-class bathrooms, one of which is en suite. The master bedroom has a 5′ bed and an en suite bathroom with a shower over the bath. There are two twin bedrooms with 3′ beds and a further double bedroom with a 5′ bed. 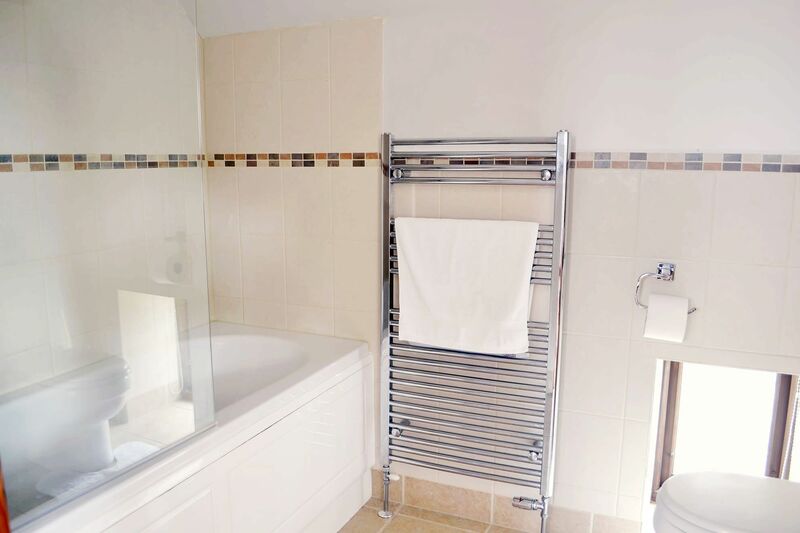 They share a large family bathroom with a free-standing bath and a separate shower. There is a further shower room on the ground floor. The accommodation boasts 2Mb wireless internet connection, and is has a private fully enclosed garden with outdoor furniture, barbecue and dog-proof fencing. An ideal base for families and groups of friends, there is parking for four cars and short and midweek breaks are available, with a minimum stay of 3 nights. Situated within the peaceful Otter Valley in a tranquil, peaceful location in East Devon, Harvest Moon is only 1.5 miles from Feniton village which has a train service (Waterloo-Exeter), pub, shops and a post office. The market town and antique centre of Honiton is only 4 miles away, boasting a variety of small independent shops, pubs and eating places. Harvest Moon is perfect if it’s a dog-friendly holiday you’re looking for. With country strolls from the doorstep, your canine pals can also roam free and romp with glee on some of the best walks on the lovely South West Coast Path, the trails at Haldon Forest Park as well as plenty of nature reserves and dog friendly beaches. The nearby Otter Inn welcomes dogs too! This semi-detached holiday property is adjacent to Hunters Moon, sleeping four. This accommodation is separate and private and has its own private fully enclosed garden with dog-proof fencing. Harvest Moon and Hunters Moon can be booked as a combination to accommodate a party of 12 and dining table at Harvest Moon can be extended to seat all guests. Please see our separate listing for Lower Curscombe Barn if you are interested in this option. 2019-04-14 J Clarke, London "We had a fantastic stay here. It was a perfect location for us to attend a wedding up the road at Deer Park Country House. We received a welcome basket on arrival which was super generous. Everything was as described and I couldn't recommend the property enough." 2017-01-02 Heather P, England "Perfect New Year getaway. Fantastic barn for a group of friends celebrating New Year! Everything was great and we loved the thoughtful welcome basket full of all the essentials and more! Will be booking again for sure. Great location too if you're looking for some peace and quiet and lots of good dog walks! Thank you!"